If your sweet tooth starts acting up in the woods, reach for the Trail Angel Cake in your pack. 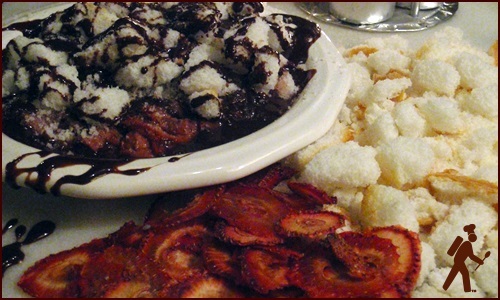 Sweet strawberries, angel food cake, and warm chocolate sauce drizzled on top will tame your cravings. Read more about dehydrating strawberries on the dehydrating fruit page. Dry angel food cake in half-inch slices and then break into smaller pieces. See the making bread crumbs and drying cake page. Pack dried strawberries and sweetened cocoa mix in separate small plastic bags. Chocolate milk powder works well. Enclose in larger plastic bag with dried angel food cake. Combine strawberries with water in pot. Light stove and warm for ten minutes over low flame. The mission is to warm and rehydrate the strawberries and create some tasty strawberry juices at the same time, not to boil the red out of them. Combine cocoa powder with four teaspoons of water in a second pot. If using one pot, transfer strawberries and juices to a serving cup and make chocolate sauce in the same pot. Stir continuously over low flame, adding more water a teaspoonful at a time until the sauce reaches desired consistency. Cover strawberries with cake crumbs. Push the cake down into the strawberry juices but don’t stir. Drizzle chocolate sauce over cake. Some of the cake will absorb the strawberry juices and some will remain crunchy. Explore with spoon.